PAT MOODLEY has been in the financial sector for over 30 years, where the desire to promote sustainable business development and economic growth has shaped his career. Moodley graduated from university with a B Com degree in accounting and later completed a National Diploma in Commerce and an MBA. Moodley has also completed the GIBS Global Executive Development Programme. 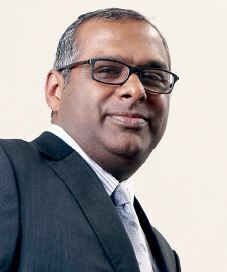 After completing his initial university degree, Moodley said he had a number of job interviews, which led him into the banking sector. He explained, "My mom said you have a job offer to go into banking - you have to go into banking. And so I did and I have never looked back." His initial position was involved in the financing of SMMEs and corporates. This experience, as well as working for other finance institutions, led him to taking up a position at the Industrial Development Corporation (IDC) where he has worked for the past 18 years. Moodley says that he is driven by the desire to grow viable and sustainable businesses that have social impact; especially businesses that create jobs to counter the high rate of unemployment. "We look at the social impact. So, when we fund a programme or a business, we always look at how we can create jobs. When you create a job, you enhance a community and you enhance a country. South Africa's current unemployment rate of about 27% is extremely high and the IDC's main objective is to reduce this rate." As the IDC plays an important role as a catalyst by assisting entrepreneurs in developing and funding their businesses, this career path has been a great choice. Moodley says that he is motivated daily by the fact that once he reaches retirement age, he will be able to reflect on his achievements and the difference that he has made. "I am inspired by making a difference. When you fund an individual, partnership or family and when the business grows, I feel a sense of accomplishment. The business is taken from one level to another. He added that when you fund a business that creates jobs, then families can be fed, and children educated. "The family can buy a house, they can buy a car; job creation really enhances society." The commitment to his multifaceted role is apparent in the long and demanding hours that Moodley puts in to ensure that his clients' needs are met. He says, "Working at the IDC is not a standard eight to five job, but one which is 365 days a year and 24/7. The job does not stop at home-time; I am often called out to assist a client at odd hours or need to attend an evening function to network with our various stakeholders." However, he said, "Dealing with people is not always easy and it takes exceptional skills, especially where finances are involved. When people need to borrow money, a range of different behaviours becomes apparent, including anxiety, which you have to respond to effectively. We try to understand the needs of our clients. Part of my role is educating my team on how to manage people and to deal with the various expectations that clients have of ourselves and the IDC's service offerings. We constantly work to empower people and their establishments, which may include identifying gaps that require attention or providing mentorship to assist the business to grow." In addition, Moodley says that although he and his team need to be very empathetic, they also need to be firm on the occasions that the IDC is unable to assist with applications for funding. He added that if a project is not fundable there are valid reasons, and these are explained to the client in detail. Moodley's advice to any one entering the finance industry is that they would need to have integrity and honesty. "It is important that there are no favours given. We finance businesses that are sustainable and economically viable. At times we must be honest with clients, which can be challenging as everyone has high expectations that you will fund their business proposals." Moodley describes himself as being very people oriented and has an open-door policy to both his employees and clients to discuss any issues arising. "We are very customer focused and ensure that we provide a high level of service as our clients are extremely important. I also believe in setting a strong example of being available to clients and will respond to every telephone caller, return calls when I am not available, as well as meet with clients on request. The buck stops with you, business accountability rises and falls on effective leadership." One of his personal traits is an insistence on punctuality. He says that he is a 'stickler for time' and he expects the same responsibility from his employees and clients, unless an apology for lateness is forthcoming. Although Moodley is very comfortable with his current achievements, he intends to ensure that the IDC continues to have an impact on the lives of people who require support. He believes that the KwaZulu-Natal Province has many opportunities and that it is important to tap into these. Moodley is married with one son. During the weekends he enjoys relaxing at home and often spends time cooking to unwind. When possible, he and his family enjoy travel to ensure that they may spend quality time together.